With all the grim news about plastics and plastic products, with much of this information already presented in my posts here on this blog, it brings to mind the question of whether there are safe plastics or not. Are all plastics poison? Or are there some that we can handle without fear? This question interested me so I thought I’d investigate. Today is World Ocean’s Day! The world’s oceans cover more than 70% of our planet’s surface and the rich web of life they support is the result of hundreds of millions of years of evolution. Nomadic peoples were collecting shellfish and harvesting fish long before the dawn of settled agriculture. Great human civilizations, from the Egyptians to the Polynesians relied on the sea for commerce and transport, and now, at the end of the Twentieth Century, our fate is as tied to the oceans as ever. We still rely on fish for a significant portion of our daily protein needs, and more than $500 billion of the world’s economy is tied to ocean-based industries such as coastal tourism and shipping. Perhaps most important, this vast mass of water acts to help regulate the global climate and to ensure that a constant flow of vital nutrients is cycled throughout the biosphere. But all is not well in the sea. Increased pressures from overfishing, habitat destruction, pollution and the introduction of invasive alien species have combined in recent decades to threaten the diversity of life in estuaries, coastal waters and oceans. Now a new threat, global warming, is making itself felt, and its impacts could be devastating for life in the sea. There can be no doubt that our world is getting warmer. 1998 was the hottest year since accurate records began in the 1840s, and ten of the hottest years have occurred during the last 15 years. 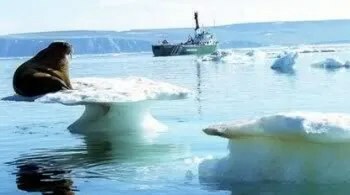 By examining growth rings from trees and ice cores drilled in Antarctica, scientists have determined that the past decade was the warmest in more than four centuries, and that the current rate of warming is probably unprecedented in at least 10,000 years. In 1992, the more than 2500 scientists comprising the Intergovernmental Panel on Climate Change concluded that the warming is caused at least in part by emissions of greenhouse gases from fossil fuel use. As the world warms, the outlook for marine wildlife looks bleak unless we can turn down the heat by reducing concentrations of the main greenhouse gas, carbon dioxide, in the atmosphere. The startling changes already beginning to affect marine life may turn out to be merely the tip of iceberg. Global warming is predicted to worsen rapidly, with average annual temperatures expected to increase by about 3 degrees C by the middle of the next century. Changes of this speed and magnitude could set off a chain reaction in marine ecosystems with truly appalling consequences for life in the sea and for human communities that depend on it. However, if we act now to reduce carbon pollution from the dirtiest power stations and from vehicle exhausts, we stand a good chance of slowing the warming and helping to save a healthy ocean for future generations. To read more about this serious issue, go to: The Facts . To sign a petition for the U.N. to designate this day, June 8, as World Oceans Day worldwide go HERE . There is a rising interest in growing organic food here in the USA. There are number of things contributing to this interest, the biggest of which is the recession. People want to save some money and grow their own eats. But there are other concerns that drive the interest, too and these include the food scares we’ve had enough of over the past year, from Ecoli on peppers to salmonella in tomatoes. More people are concerned about the planet and trying to cut down on eating meat, which has been named as a big source of CO2 and methane and so are looking to grow their own, safer and greener, food. I am sure there are other concerns driving this trend, including my own which is simply to have inexpensive, safe, organic food for my vegan diet. Along with growing organically comes the big concern of how to control pests and diseases. The preponderance of pests that eat up the garden and diseases that fell the best intentions are the sole reason why mankind created tons of chemicals that poison everyone to begin with. If we could just grow a healthy, productive garden by plugging in a seed and letting nature take it’s course, we wouldn’t be in such a quandary. But after years of trying, failing, succeeding and struggling with one garden after another, I can tell you that the bugs will come, the disease will appear and environmental factors will rear their ugly head and put an end to your veggie dreams. So how do you grow vegetables organically? It’s just not as easy as it seems, believe me. What I am going to try to do in this post is touch the tip of the iceberg with some tips and solutions for common problems you will face when trying to start the organic garden. This will be the first of many posts to come throughout the summer, as the topic is huge and can’t be covered in a single article. But today I will give some basic tips on how to keep those bugs and diseases out of your veggie stash. I have got to tell everybody about this great new item, Eco Canteen. It is a real life solution to a big environmental problem, the toxic plastic bottle. I have posted about plastic bottles in the past, at Toxic Plastics , but I have only begun to tap the subject. If you don’t get what all the fuss is about, then you need to read the posts I did previously after you read this one. I am sure you will be looking for an alternative as soon as you realize what a huge problem this has become. Here are some real, scary and documented facts about plastic and plastic bottles. Many years ago I used to visit my cousins on their dairy farm in upstate New York. A foggy, sprawling area of marsh and farmland, the moors are kind of creepy. But they had what was considered to be a medium scale farm in those days, with a few lines of cows and a few milking machines. The cows were treated pretty well, milked when they could be milked and allowed to feed their calves after birth. The calves were sold off at auction later on, when they were ready. This was their operation, small, clean and profitable. But times have changed. The need for milk production has exploded beyond the capacity of family dairy farms and the constant demand has fueled enormous operations that must produce 24/7 365. And, as with all other big business applications, money is the bottom line for the milk industry. The major contributor to these factory scale dairy operations and their profitability is recombinant Bovine Growth Hormone, also referred to as rBGH or rBST. This is an artificial growth hormone developed by Monsanto to increase dairy cows’ milk output. Industrial agriculture proponents proclaim that farming on a large scale, and using technology such as rBGH, is better for the environment. But is it really?